Bridgeview Community Action Group will hold an Information Session in conjunction with the Deltaport Third Berth Project Information Session at Tsawwassen Golf and Country Club, 1595-52 Street Delta, BC, Tuesday December 2, 2008 from 6:00 to 8:00 pm. 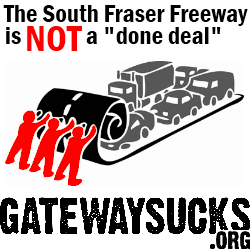 Port expansion & Gateway – white elephants both – stop Gateway at the source! Please join us, bring your own information sign if you have one, or use one of our extras. For more info contact Bernadette. You are encouraged to attend Metro Vancouver’s Burns Bog Ecological Conservancy Area (ECA) Management Plan Overview to demand that Burns Bog be protected from the ravages of Gateway. Thursday, December 4, 2008, 6:30 – 9 pm, Delta Town & Country Inn, 6005 Highway 17 (at Highway 99), Delta, The Reifel Salon. Electoral Reform: it’s a good thing… find out why. Craig Henschel of the Citizens’ Assembly will give a presentation on the BC-STV system that we can choose in the referendum on May 12, 2009. Thursday December 4, 2008, 7:00 – 8:30 pm, Bridgeview Community Hall, 11475 126A Street, Surrey. About the images above: On the left is an old growth spruce tree on the South Fraser Witness Trail. On the right is farmland being covered in sand for the South Fraser Perimeter Road. Why are Roads different to Transit?